3'-monophosphates of HNE-dG by the following procedure: A typical reaction mixture containing HNE-dG 3'-monophosphates (~30 /zg) in 100 ¡i\ of H20, 100 fi 1 of ATP (1 mg/ml in H20; Sigma, St. Louis, MO), 60 /il of 500 mM Tris base, and 50 /i\ of kinase buffer [a buffer made of 500 fi\ of 400 mM dithio-threitol (Sigma), 55 /xl of400 mM spermidine (Sigma), 500 ¡i\ of 400 mM MgCl2, 500 ii 1 of 800 mM Bicine (pH 9.8; Sigma), 445 /¿I of H20, and 7 /il of T4 PNK (30 units/ju.1; Amersham, Arlington Heights, IL)] is incubated at 37° for 60 min. The 3',5'-bisphosphates of HNE-dG formed are collected by HPLC system 4. The identities of the 3'-monophosphates and 3',5'-bisphosphates of HNE-dG are established by the characteristic UV spectra of l-A^-propano-dG and by conversion to the nucleosides with alkaline phosphatase. For dephosphorylation, 15-20 nmol of the bisphosphates is taken up in 30 /i l of phosphate buffer (50 mM, pH 5.8) mixed with 30 fil of Tris-HCl (50 mM, pH 7.0) and 200 units of alkaline phosphatase (type VI1 TA; Sigma). The mixture is incubated at 37° for 40 min. The comigration of the dephosphorylated products and their UV spectra, identical with the authentic HNE-dG adducts in HPLC system 5, serve to confirm their identities. Tissue DNA is isolated by a modified Marmur's procedure.27 Depending on the quantity of tissue available, the procedure may be modified. For example, in addition to reducing the volumes of the buffers proportionately, it is also possible to omit the interim precipitation step if only 100-300 mg of tissue is used for DNA isolation. Tissue Homogenization. Typically, 2-5 g of tissue in a 100-ml beaker is thawed on ice, washed with a cold (4°) NaCl-citrate buffer (150-15 mM, pH 7.0) to remove blood, and minced to fine pieces with scissors. A mixture of cold NaCl-citrate buffer (8 ml/g of tissue) is then added. The tissue is homogenized with a Polytron Tissuemizer (Janke & Kunkel; IKA Works USA, Wilmington, NC) set at 70% of maximum speed for 60 sec. The homogenizer is stopped and the homogenate is cooled on ice at 30-sec intervals. The homogenized tissue is poured into a 40-ml plastic tube and centrifuged at 9500 rpm (12,000g) for 20 min at 4°, using a centrifuge (model J2-21M; Beckman, Fullerton, CA) with a JA-17 rotor. The pellet containing the nuclear fraction is saved and suspended in a cold Tris-EDTA-NaCl buffer (10 mM-1 mM-1 M, 6 ml/g of tissue). the mixture is incubated at 37° for 40 min. An equal volume of Sevag [chloroform-isoamyl alcohol, 24:1 (v/v); J. T. Baker, Phillipsburg, NJ) is added to the incubation mixture and the mixture is shaken vigorously on a wrist action shaker for 15 min. The mixture is then centrifuged at 9500 rpm for 15 min at 4°. The upper layer is pipetted into a Teflon flask and extracted again with an equal volume of Sevag to remove all the proteins. An equal volume of cold ethanol (—20°) is added to the flask containing the aqueous layer; the mixture is swirled gently and kept in a —20° freezer for at least 60 min to facilitate the precipitation of DNA/RNA. The flask is then swirled gently and the precipitate is collected with a hooked glass rod or a pipette. Removal ofRNA. The DNA/RNA precipitate is dissolved in a Tris-HCl buffer (10 mM-1 mM, pH 7.0, 1 ml/g of tissue) in a 50-ml flask followed by vigorous vortexing. A solution of RNase A (9 units/g of tissue; Sigma) (see below) and RNase T1 [100,000 units in 200 /xl, suspended in 3.2 M (NH^SC^ solution, pH 6.0, 1600 units/g of tissue; Sigma] is added sequentially to the DNA/RNA solution. The mixture is incubated at 37° for 40 min, proteinase K (3 units/g of tissue) is then added, and the mixture is incubated for an additional 30 min to remove any protein contamination. The incubation mixture is extracted with Sevag (2 volumes). The mixture is shaken for 15 min and then centrifuged at 12,000 rpm (20,000g) for 20 min at 4°. The top layer is pipetted to a flask and extracted with 2 volumes of Sevag at least twice or until the UV absorbance of DNA in the aqueous layer shows a ratio of ~ 1.8-2.0 at 260/280 nm and ~0.40-0.45 at 230/260 nm. A solution containing NaCl (5 M, 0.1 ml/g of tissue) and an equal volume of cold ethanol (—20°) is added. After the solution is swirled gently, it is kept in a —20° freezer for 60 min to precipitate DNA. The DNA precipitated is spooled out with a glass rod or a pipette, and washed with cold ethanol twice, a mixture of ethanol-ether (50:50, v/v) once, ether twice, and finally dried under a stream of N2. The DNA is then dissolved in NaCl-citrate buffer (diluted 100-fold from a stock solution of NaCl-sodium citrate, 150 mM-15 mM) to make a final concentration of 2 /¿g//il, and stored in -80°. Preparation of RNase A Solution. The RNase A solution is prepared by dissolving 10 mg of RNase (78 units/mg; Sigma) in 1 ml of sodium acetate (10 mM, pH 5.0). DNase activity in the solution is destroyed by heating at 90° in a water bath for 10 min. The solution is then stored at —20°. DNA (80-100 /ig, 2 fig/fi\) in NaCl-citrate buffer (see above) is incubated for 3.5-4 hr at 37° with a freshly prepared solution containing micrococcal nuclease (0.3 units//x 1, 15 ¿¿1/100 fig of DNA; Sigma), spleen phosphodiesterase (3 /xg//il, 15 /7.1/100 fig of DNA; Worthington, Freehold, NJ), sodium succinate buffer (300 mM,pH 6.0,10/il/100/igofDNA),andCaCl2(100mA/, 10/zl/100/ig of DNA). The digested DNA is diluted to 1 ml with ammonium formate buffer (225 mM, pH 7.0) and the diluted DNA hydrolysate is taken up with a 1-ml tuberculin syringe and slowly filtered through an Acrodisc syringe filter (0.2 pm, 13-mm Minispike; Gelman, Ann Arbor, MI). One-tenth of the total hydrolysate is used to quantify dG 3'-monophosphate by HPLC (see section on quantification of HNE-dG adducts, below). The remaining hydrolysate is subjected to sample enrichment steps. The large excess of normal nucleotides present in the DNA hydrolysate compared with HNE-dG adducts represents the main source of interference for labeling the adducts. Therefore, a method combining solid-phase extraction (SPE) and nuclease PI was developed to enrich the adducts by removing normal nucleotides before 32P labeling. Solid-Phase Extraction. The DNA hydrolysate (80-100 fig of DNA) is applied to a preconditioned (washed with 15 ml of methanol and then with 15 ml of H20) C18 solid-phase extraction column (Cig Bond Elut, 3 ml/500 mg; Varian, Palo Alto, CA). The column is washed by gravity with 3 ml of 50 mM ammonium formate buffer (pH 7.0), followed by 3 ml of 10% (v/v) methanol in ammonium formate. The fraction containing the HNE-dG 3'-monophosphates is eluted with 6 ml of 50% (v/v) methanol in H20. The collected fraction is dried partially in a Speed-Vac and then transferred to a microcentrifuge tube. Nuclease PI Treatment. The fraction containing HNE adducts in a microcentrifuge tube is evaporated to dryness in a Speed-Vac. A premixed solution containing 12 pi of nuclease PI (4 ng//A in H20; Sigma), 2.5 /A of sodium acetate (1 M, pH 5.0), 5.5 p1 of 1 mM zinc chloride, and 20 fi\ of H20 is added to the adduct fraction. The mixture is thoroughly mixed by vortexing, spun in a microcentrifuge for 1 min, and then incubated at 37° for 60 min. At the end of incubation, a solution of 6.5 pi of 500 mM Tris base is added to the solvent before the mixture is evaporated in a Speed-Vac. (pH 3.5) for 16-18 hr, it is air-dried and spotted with radioactive ink [200 /A of "Tc (0.5 mCi/ml)-800 /xl of H20-1000 /xl of black ink] and autoradiographed in steel cassettes on Eastman Kodak (Rochester, NY) XAR film for 20 min at room temperature. The film is then developed, fixed, and dried. Each adduct spot, identified by comparison with the simultaneously labeled 3'-monophosphates of HNE-dG standard, is excised and extracted with 1.5 ml of isopropanol-ammonia mixture [isopropanol-H20-ammonium hydroxide (15 N), 2.5 :1.5 :1 (v/v/v)] by shaking in a water bath for 12 min at 37°. The extract is filtered through an Acrodisc syringe filter into a 7-ml glass vial, and the filtrate is evaporated to dryness in a Speed-Vac and reconstituted in 750 of H2O. The synthetic 3',5'-bisphosphates of HNE-dG are added to the sample as UV markers before it is purified by reversed-phase HPLC systems 6 and 7 in sequence. The purified fraction containing the 3',5'-bisphosphates of HNE-dG is again dried in a Speed-Vac and reconstituted in 500 ¡A of water. One-half of the purified fraction is analyzed with HPLC system 4. The identities of HNE-dG adducts are first established by their comigration with the UV standards (Fig. 1). Subsequently, they are verified by two conversion reactions; one involves enzymatic hydrolysis to the 5'-monophosphates of HNE-dG with T4 PNK, and the other involves treatment with sodium borohydride to yield the ring-opened products. 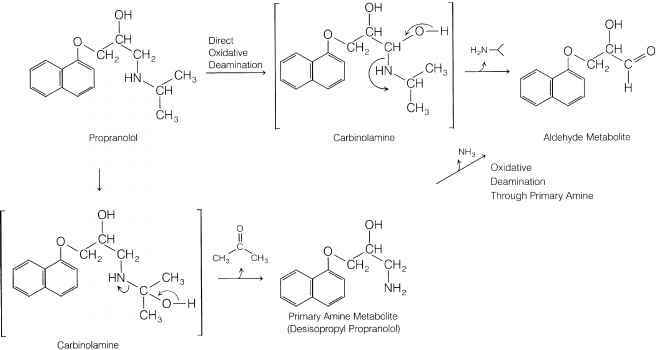 The procedures for these conversion reactions are described below. Chemical Ring-Opening Reduction. A quarter of the purified fraction is reacted with NaBH4 (5 mg/ml) in 200 /il of K2C03 (0.5 M, pH 12.0). The reaction mixture is stirred at room temperature for 20 min. The pH of the reaction is then adjusted to pH 7.0 with 1 N HC1. HPLC analysis (system 4) of the reaction mixture shows four new peaks eluting before the 3',5'-bisphosphates of HNE-dG (Fig. 2a). Comigration with the ring-opened 3',5'-bisphosphates of HNE-dG UV markers confirms their identities. It should be noted that the sequence of elution of the ring-opened adducts is different from that of the cyclic HNE adducts. The identities of the ring-opened 3',5'-bisphosphates of HNE-dG UV standards are established by their UV spectra and by conversion to the corresponding nucleoside adducts with alkaline phosphatase. Comigration of the dephosphorylated products with the ring-opened HNE-dG (HPLC system 9), whose structures are characterized by UV, NMR and mass spectra,7 is taken as a confirmation of the identities. Tris-HCl (pH 6.8)], and the mixture is incubated at 37° for 1 hr. After incubation, the mixture is filtered through an Acrodisc syringe filter and analyzed with HPLC system 8. Comigration of the hydrolyzed products with the UV markers of 5'-monophosphates of HNE-dG serves as confirmation of identities (Fig. 2b). Recovery of tert-4-Hydroxy-2-nonenal-deoxyguanosine Adducts. The recovery of adducts is determined with a sample of adduct standards. Five to 20 fmol of the 3'-monophosphates of HNE-dG are mixed with 15 /zl of each of the four normal nucleotides (5 nmol//xl). This sample is analyzed as are other DNA samples, except that the DNA enzymatic hydrolysis step is omitted. The radioactivity of the comigrating peak in the final analysis is converted to femtomoles (assuming 100% labeling efficiency, 1 fmol = 10,000 dpm based on the specific activity of ATP, ~6000 Ci/mmol). The percentage of the recovery is calculated by dividing the amount of adduct obtained from the final analysis by the amount added at the beginning of the assay. Levels of Adducts in DNA. The levels of adducts in DNA are determined by the radioactivity of adduct peaks after adjusting for decay and recovery, using the following equation, and are usually expressed as micromoles of adduct per mole of guanine (or femtomoles of adduct per nanomole of guanine). The amount of 3'-monophosphates of dG in DNA is quantified with 10% of DNA hydrolysate by comparison with the nucleotide standard, using HPLC system 10. To ensure the assay is free of contamination, a blank sample containing 50 pg of oligonucleotide [poly(dA • dC): poly(dG • dT); Sigma] as a negative control is included for each set of DNA samples to be analyzed. In addition, it is advantageous to include a previously analyzed DNA sample of known adduct level as a positive control. We usually use rat liver DNA for this purpose. detector and a j8-Ram flow through system (IN/US) are used. Linear gradients are used in all solvent programs. The Prodigy ODS 3 (Phenomenex, Torrance, CA), 5 |U,m, 4.6 x 250 mm Cig reversed-phase column is used for all the systems, except that a Prodigy ODS 3 (Phenomenex), 5 /im, 10 x 250 mm Cig reversed-phase column is used for system 1.